In today’s digital economy, the most common trend we have seen is the platform-based business model. Uber, the largest taxi company, owns no cars. Alibaba, the most valuable retailer, has no inventory. Airbnb, the world’s most popular accommodation provider, owns no real estate. Yet, through these intermediary platforms, passengers can find drivers, buyers can find sellers and tourists can find lodging. All stakeholders on these platforms benefit from the win-win-win proposition, thanks to the network effect. Up until recent years, banks were the dominant financial intermediaries that facilitated the exchange of funds between savers and spenders. While the dominant market position provided banks with monopoly power and all the benefits that come with it, it also disincentivized them to be economically efficient in terms of optimizing productivity and decreasing cost, leading to reduced benefits for consumers and deadweight loss. In worst case scenarios, it also created the opposite of economies of scale. Over the last few years, there has been an insurgence of FinTech companies and “Challenger Banks” that are dedicated to disrupting market conditions. They benefited largely from lower barriers of entry to market resulting from deregulations (mainly PSD2 in Europe) and the ubiquitous mobile access for consumers. Take N26 for example, it now has 1 million customers and transacts €1 billion a month. Central to their success, is their ability to incorporate digital experience and strategy in their roadmap for the future. These new players quickly adjusted to customers’ mobile-first and moving from offline to online behavior changes, and are able to provide safe, real time, automated, smart solutions. While it is common to feel threatened by new competitors, it is also a huge opportunity for banks to ride with. Contrary to the mindset that they need to incorporate technology into all the aspects that they are historically good at and develop everything in-house, they should embrace the concept of banking-as-a-platform and become the assembler of this value network. By decoupling the technology with distribution, they can outsource the best existing services out there, while contributing to the platform with their expertise in compliance, security, authentication and so on. Some early adopters have already embarked in this digital transformation journey and tapped into new revenue streams while maintaining their relevance to financial industry in this digital world. Moven, for example, a mobile-centric banking app, has extended a five-year contract with TD Bank to be the tech provider of TD MySpend, a real-time personal financial management tool. In fact, as early as 2009, Chris Skinner, a leading industry thinker has raised the idea of banking-as-a-platform. At FinConecta, we have built the 4wrd platform to help financial institutions accelerate their digital transformation journey. To put it simply, the base layer is the licensed and regulated banking back-end. The middle layer is the middleware that provides the integration infrastructure and universal APIs (in this case, 4wrd!) that allows easy plug-and-play integrations. Banks also don’t need to spend time on developing APIs, as the middleware simplifies the standardization of them. 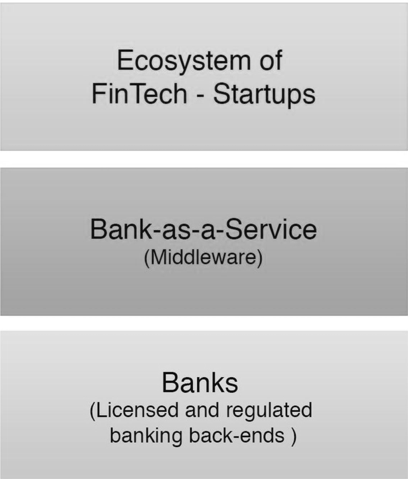 The top layer is the FinTech ecosystem that can be plugged into the middleware. As one of the fastest growing industry, it is our endeavor to constantly scout and vet the most specialized FinTech players for Financial Institutions to partner with. Rest assured, the platform-based banking model still allows banks to own the end-to-end process with their customers; the difference is, instead of owning every product and services, they open their arms to welcome other FinTech companies to help them elevate their customer experience with an omni-channel digital experience. A major transformation does not happen overnight. It requires a comprehensive digital transformation blueprint initiated by the leadership team to progressively convert to an open platform that calls for collaboration instead of a full-stack vertical integration. By combining business model, culture and organization, approach to innovation and client engagement, the five ingredients form a holistic approach to reimagine and reinvigorate the traditional financial services model. At FinConecta, our goal is to help you with this digital transformation journey and make it as simple and seamless as possible. We hope you move 4wrd with us in this fascinating journey.